​In chapter 3 of Paul’s letter to the church at Colosse he is talking to them about putting on their “new self” because with Christ they have put to death the "old self" and have risen to newness of life. In this passage Paul defines Christian character rather than prescribe rules to obey. For him, morality is a matter of what sort of person one becomes in Christ, where one "puts on" the capacity for doing the good that God has willed. 12 So, as those who have been chosen of God, holy and beloved, put on a heart of compassion, kindness, humility, gentleness and patience; 13 bearing with one another, and forgiving each other, whoever has a complaint against anyone; just as the Lord forgave you, so also should you. 14 Beyond all these things put on love, which is the perfect bond of unity. Did you know that according to Jewish psychology, the heart is the location of volition [where our will and desires reside]; one's entire life is guided by what takes place in the heart. ​To put this in a more common saying, “garbage in, garbage out.” What we are filling our heart with will spill out into our lives through our attitudes, actions, decisions and words. 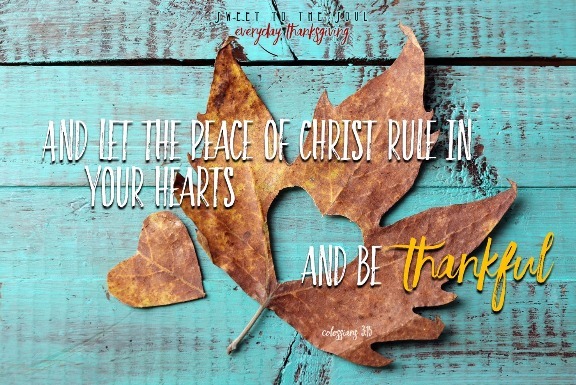 If the peace of Christ rules the heart, then every decision made and every action taken will have the quality of peace. Now, having peace does not mean to be in a place where there is no noise, trouble or hard work. It means to be in the midst of all those things and still be calm in your heart. To have peace, we must choose peace. 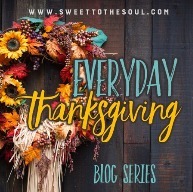 Likewise, we must also choose thankfulness. “And be thankful” may seem odd thrown in with “let peace rule your hearts” but actually the two go hand in hand. You see, thankfulness brings contentment and contentment brings peace.